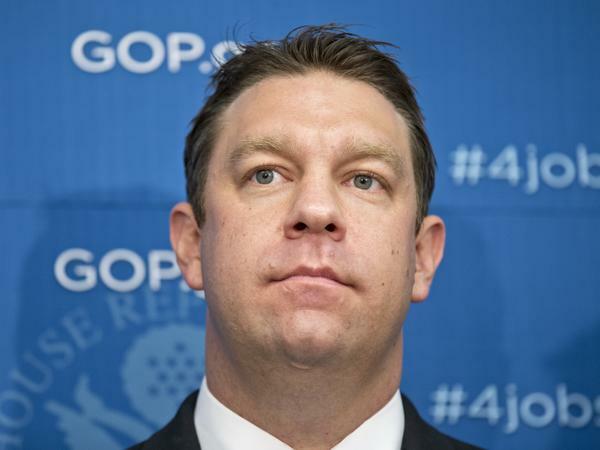 U.S. Rep. Henry "Trey" Radel, R-Fla., at a Capitol news conference on July 9. It was November when Republican Trey Radel, a first-term congressman from Fort Myers, Fla., was charged with cocaine possession — a misdemeanor in Washington, D.C. He pleaded guilty and was sentenced to a year's probation. A few days before Christmas, fresh from a month in rehab, Radel held a news conference with his wife by his side. He apologized and said that alcohol, not cocaine, is his main problem, and that's what he was treated for. But the main point of his news conference was to say that he would not step down from Congress. "I love what I do," Radel said. "And I'm going to return to what I do, what you sent me to do in Washington, D.C — which is working for you and your family." That's caused some consternation among GOP leaders in southwest Florida. Following his arraignment on drug charges, they called on Radel, a former TV anchor who represents a heavily Republican district, to resign. Terry Miller, the Republican chairman in Lee County, Fla., says Radel's time in rehab and apology have done nothing to change that. Miller says he believes in apologies and second chances. But, Miller says, "When you betray the public's trust and you put yourself in illegal activity — and let's be clear, what he did would have been a felony had it happened in his home state — I think that disqualifies you from representing your constituency." He may be an embarrassment to some Republicans, but for comedians like Comedy Central's Stephen Colbert, Radel has been another Florida punch line. Shortly after the arrest, Colbert skewered Radel's vote supporting a bill that would have required drug tests for people receiving food stamps. "Now, now, he's not a hypocrite," Colbert said. " 'Cause he doesn't get food stamps from the government — just his paycheck." And despite his arrest, on that point — his vote to drug-test food stamp recipients — Radel isn't backing down. With remarkable political chutzpah, he announced at his post-rehab news conference that he'd like to take it further — and drug test elected officials. "I think members of Congress can and should be tested as well," Radel said, apparently without irony. His reasoning? "Maybe it will help someone else in the future." The House Committee on Ethics has announced that it is investigating whether Radel's cocaine possession charge violates Congress' code of conduct. Those investigations typically take months. The question Radel hasn't definitively answered yet is whether he plans to run again when his congressional term expires this year. But several other Republicans are exploring runs. One likely candidate for Radel's seat, former Republican state Rep. Paige Kreegel, already has significant backing. A superPAC in southwest Florida has raised more than $1 million to back Kreegel in the race. Miller of the Lee County GOP thinks his constituents will reject Radel. He says he expects campaign donors will as well. "We'll see how they react to this," Miller says. "I would have to speculate only that it's going to be much harder for some folks to write checks." One of the more interesting congressional primaries we'll be watching this year involves Florida Republican Trey Radel. He was charged in November with cocaine possession in Washington. After a month in rehab, Radel is now out and planning his return to Congress. NPR's Greg Allen reports that's caused some consternation among Republican leaders in southwest Florida. GREG ALLEN, BYLINE: It's usually OK when your local congressman is on the national news, but not when it's after a drug bust. ALLEN: It was in November when Radel, a first-term congressman from Fort Myers, was charged with cocaine possession, a misdemeanor in Washington. He pleaded guilty, was sentenced to a year's probation, and then went into rehab. A few days before Christmas, he was out and immediately held a news conference. With his wife by his side, he said he was sorry. Alcohol, not cocaine, is his main problem, he said; and that's what he was treated for. But the main point of his news conference was that he would not step down from Congress, despite calls from Republican leaders. REP. TREY RADEL: I love what I do. And I'm going to return to what I do - what you sent me to do in Washington, D.C. - which is working for you and your family while I relish mine. ALLEN: Radel is a former TV anchor who represents a heavily Republican district in southwest Florida. Following his arraignment on drug charges, GOP leaders throughout Florida called on him to resign. Terry Miller, the Republican chairman in Lee County, Fla., says Radel's time in rehab, and apology, have done nothing to change that. TERRY MILLER: I certainly believe in second chances. Unfortunately, when you betray the public's trust and you put yourself in illegal activity - and let's be clear, what he did would have been a felony, had it happened in his home state - I think that disqualifies you from representing your constituency. ALLEN: He may be an embarrassment to some Republicans, but for comedians like Comedy Central's Stephen Colbert, Radel is another Florida punch line. STEPHEN COLBERT: He actually voted to drug-test people who receive food stamps. COLBERT: ... just his paycheck. ALLEN: On that point - his vote to drug-test food stamp recipients - Radel isn't backing down. With remarkable political chutzpah, at his post-rehab news conference, he said he'd like to take it further. RADEL: With drug-testing for food stamp re - I think members of Congress can and should be tested as well. And maybe it will help someone else, in the future. ALLEN: The House Ethics Committee has announced it's investigating whether Radel's cocaine possession charge violates Congress' Code of Official Conduct. Those investigations typically take months. The question Radel hasn't definitively answered yet is whether he plans to run again when his congressional term expires this year. But several other Republicans are exploring runs. Lee County GOP chairman Terry Miller thinks if they have the chance, his constituents will reject Radel. And he expects campaign donors will as well. MILLER: His financial supporters, we'll see how they react to this. I would have to speculate only that it's going to be much harder for some folks to write checks. ALLEN: One likely candidate for Radel's seat, former Republican State Rep. Paige Kreegel, already has significant backing. This week, a homebuilder in southwest Florida formed a superPAC with more than a million dollars, to back Kreegel in the race. Greg Allen, NPR News, Miami. Transcript provided by NPR, Copyright NPR.